This tutorial is not approved by or associated with Mojang or Minecraft. To run a dedicated Minecraft server, you need to have a dedicated server machine, plenty of RAM, and plenty of bandwidth. Why not let Google handle these requirements for you? In this tutorial, you'll learn how to install, configure, and run a standard Java Minecraft server on Google Compute Engine. This server is compatible with standard Java-based desktop Minecraft clients. Your Minecraft server software will run on a Compute Engine instance, which is a virtual machine that runs on Google's infrastructure. This tutorial uses the default machine type for Compute Engine instances, n1-standard-1. The n1-standard-1 machine type includes a 10 GB boot disk, 1 virtual CPU (vCPU), and 3.75 GB of RAM. This machine type runs Debian Linux by default. To make sure there's plenty of room for your Minecraft server's world data, you'll also attach a high performance 50 GB persistent solid-state drive (SSD) to your instance. With the addition of this persistent SSD, your instance will satisfy the system requirements for a dedicated Minecraft server, supporting up to 50 players comfortably. Note: The above machine and disk specifications are not meant to be a general recommendation for all Minecraft servers running on Compute Engine. When setting up your own Minecraft server, choose a machine type, disk type, and disk size that reflects your own I/O and resource needs. You'll arrive at a dialog prompting you to create a new Compute Engine instance. Name your instance. This tutorial uses the instance name mc-server throughout. Select the zone in which you want your instance to be hosted. This tutorial uses the zone us-central1-f throughout. In the Boot disk section, click Change. The Boot disk dialog will pop up. Change the disk type to SSD Persistent Disk. Click Select to commit the change and close the dialog. That's it for basic configuration! That said, don't create your new instance just yet—to meet the requirements for a dedicated Minecraft server, you'll need to configure some advanced settings as well. Under Identity and API access, click the Service account dropdown and select Compute Engine default service account. Set Access scopes to Set access for each API. In the Storage dropdown, select Read Write. Click Management, security, disks, networking, sole tenancy to reveal a set of tabs for advanced settings. In the Networking tab, add the tag minecraft-server to the Network tags field. In the Networking tab, in the Network interfaces section, click Default. The Network interface configuration menu appears. Name your IP address mcs-ip. Click Reserve to create the address. Click Done to commit your changes and close the Network interface configuration menu. Next, you'll attach a persistent disk to your instance. Unlike boot disks, persistent disks are not tied to the life of your Compute Engine instance. For example, if your hosting needs change over time, you can move the disk to a more suitable machine type later. The specific type of persistent disk you will use in this tutorial is a persistent SSD. This type of persistent disk supports very fast I/O operations, which can help reduce server lag. Click Create to create the new disk. When you create the instance, the disk will be attached automatically. That's it for instance configuration! Click the Create button at the bottom of the page to create your new instance. This action will also take you back to the VM instances page. Note: It can take up to 20 seconds for your instance to be created. At this point, your disk is attached to your instance, but it hasn't yet been mounted to the instance. That's okay—if you mounted the disk now, you wouldn't be able to do much with it. That's because, as with any disk, your persistent disk first needs to be formatted with a filesystem that your operating system—in this case, Debian Linux—can understand. You'll use this directory as a mount point for your persistent disk. Your persistent disk is officially mounted. Now it's time to do what you came here to do in the first place: install and run your Minecraft server. The Minecraft server runs on top of the Java Virtual Machine (JVM), so it requires the Java Runtime Environment (JRE) to run. Because the server doesn't need a graphical user interface, this tutorial uses the headless version of the JRE. This approach reduces the JRE's resource usage on your machine, helping ensure that the Minecraft server has plenty of room to expand its own resource usage if needed. Note: This tutorial uses minecraft_server.1.12.2. However, a newer version might have been released since this tutorial was published. You can find a link to the latest JAR file by visiting the Minecraft download page. This file contains a single boolean variable, eula. To use the Minecraft server, you must accept the terms of the Minecraft End User License Agreement (EULA). If you accept the terms of the EULA, set the value of eula from false to true, then save and exit. For a complete description of each property type and its possible values, see the server.properties page on the Minecraft Wiki. If you start the Minecraft server again at this point, it will be tied to the life of your SSH session—that is, if you close your SSH terminal, the server will be terminated as well. To get around this issue, you can use screen, an application that allows you to create a virtual terminal that can be "detached," becoming a background process, or "reattached," becoming a foreground process. When a virtual terminal is detached to the background, it will run whether you are logged in or not. Finally, detach your screen terminal again if needed. Type exit once to leave root user mode, then type exit again to close your SSH connection. Congratulations! You now have a running Minecraft server. However, it's not quite ready to be shared just yet. Before you can share your server, you need to set up a firewall rule that will allow people to access it. In the table of available networks, in the Name column, click the default network. On the VPC network details page, in the Firewall rules tab, click Add firewall rule. Note: By default, the Minecraft server uses 25565 as its default listening port. You can change this port number by editing server.properties, the configuration file for your Minecraft server, and restarting your server. Make sure to change the number in the firewall rule as well. Click Create to create your new firewall rule. Users can now access your server from their local Minecraft clients. Whether you're running a local Minecraft client or running a Minecraft server, it's a good idea to back up your Minecraft world data on a regular basis. 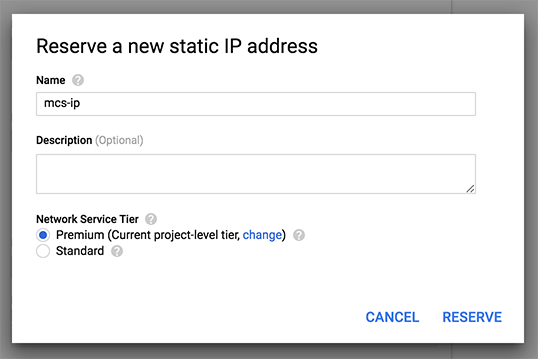 This section demonstrates how to set up regular backups of your world data using Google Cloud Storage. Note: Your bucket name must be unique across Cloud Storage. This script begins by saving the current state of your world data and pausing your server's auto-save functionality. Next, the script backs up your server's world data directory (world), placing its contents in a timestamped directory (<timestamp>-world) in your Google Cloud Storage bucket. After the script finishes backing up the data, it resumes auto-saving on the Minecraft server. After the script finishes, visit the Storage browser in the GCP Console and click on your bucket. You should see a timestamped backup of your world directory. Unless you prefer to manually initialize each backup, you'll probably want to have your script run automatically at predictable intervals. To accomplish this task, you need to schedule a new cron job. That's it! Your Compute Engine instance will now automatically back up your world data to a Google Cloud Storage bucket every 4 hours. If you back up your world data every 4 hours, that means you're backing it up 6 times a day, 72 times a week, and roughly 300 times a month. You can remove old backups automatically by using a feature of Cloud Storage called Object Lifecycle Management. 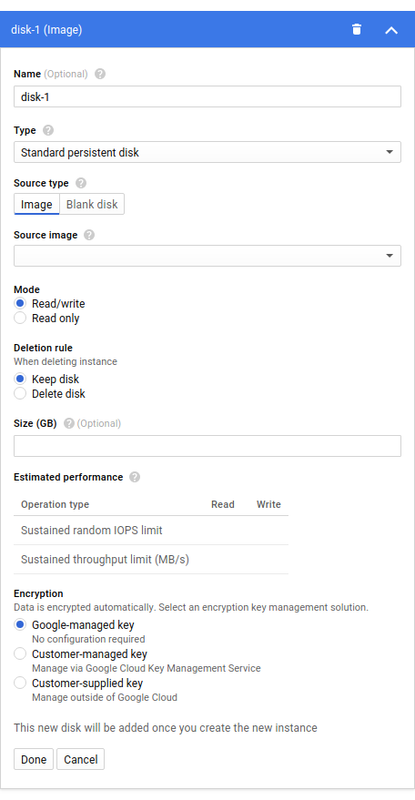 This feature allows you to configure your Cloud Storage bucket to automatically archive or delete old backups after a certain time or if there are newer backups available. In the bucket list, find your Minecraft backups bucket. Click None in the bucket's Lifecycle column. The View object lifecycle rules page appears. In the Select object conditions section, select Age. Set the age to 7 days and click Continue. In the Select action section, select Delete and click Continue. Click Save to save your settings. You're taken back to the View object lifecycle rules page. Each backup will now be deleted one week after your backup script sends it to Cloud Storage. If you don't need to run your Minecraft server, you should shut it down to avoid incurring unnecessary expenses. Now that you've stopped your Minecraft server, you can safely shut down your instance. On the VM instances page, click on your instance's name and then click the Stop button at the top of the page. You will be logged out of your SSH session. To start up your instance again, visit your instance page and then click the Start button at the top of the page. To start the Minecraft server again, you can establish an SSH connection with the instance, remount your persistent disk, and start your Minecraft server in a new screen terminal, as described in the Run the Minecraft server section. When you restart your instance, this script will automatically mount your Minecraft disk to the appropriate directory, reinstall your cron job, start your Minecraft server in a screen session, and detach the session. At the bottom of the page, click Save to commit your changes. When you stop your instance, this script will shut down your Minecraft server before the instance shuts down. The Minecraft Wiki provides tons of useful resources for Minecraft players and Minecraft server administrators alike. The vanilla Minecraft server you installed in this tutorial is just one of the many Minecraft servers available. Visit Custom servers in the Minecraft Wiki to see a list of alternative servers that have been optimized for game types, machine requirements, easy modifications, and more.